Who is a Commercial Airline Pilot? In the long line of aviation related prospects, the commercial pilot service falls under the category of a civilian pilot. To become a commercial airline pilot one has to enroll to an aviation school or pilot training schools but it is to be taken into account that pilot schools have a large fee requirements probably about eighty to ninety dollars per hour depending on the affiliation and status of the institutions. The job of a commercial airline pilot in the USA basically is to fly a civilian plane as a means of transportation inspite of perhaps the only other transport that can cover that much distance of travel i.e. the ship or any other nautical means of transport, in terms of both domestic and international trajectory of travel. Since commercial airplanes are assigned only for civilian purposes it marks a break from carrying out any work related to the military and hence is not subject to any purpose of travel in relation to wartime period and into warzones except in times of absolute emergency. Also, a service in aviation demands a peripatetic lifestyle i.e. a pilot has to be away from home and family at time for as long as months in case of contiguous duty. Nevertheless, most airplanes keep additional pilots so that at time of personal emergency the pilot concerned may attend to his private affairs. All in all, the life of a commercial pilot is full of responsibility with the life of thousands depending on them as they fly the airplane safely through the air, making it possible for everyone on board to reach the destination on time in the least time consuming manner possible. The following mentioned are few requirements to become a pilot. It also includes few of the qualities that help in becoming an airline pilot. The first and foremost thing that a commercial pilot has to have is a dauntless attitude in the face of danger. How else would a pilot fly a plane with so many passengers if he himself is at unawares and unconfident as to what might take place if the air is not clear! Since it is quite a common phenomena to encounter a calamity in spite of all efforts to keep the vehicle above earth’s atmospheric level. But due to the earth’s elliptical shape the atmospheric layers are not uniform at a certain altitude owing to the location and so despite of all efforts pilots do have to face problems related to visibility and aerial reception. Nonetheless these are ordinary problems nowadays in the service and are mostly overcomed without even a small outbreak of panic. A commercial pilot has to be highly equipped in a special set of skills which first of all include powerful communication. It is needless to say that a pilot and a co-pilot are one soul in two bodies once the plane is airborne, what matters the most is the pilots ability to instill confidence in the passengers in times of need and also adept in handling matters of direction and landing if the radio is cut off. A presence of mind is the prime factor in case you want to be a commercial pilot, as flying a commercial plane often involves emergencies like rerouting for reasons that might not be in the best interest of all those travelling. And the pilot behind the wheel has the lives of more than 500 people and hope of a 1000 more awaiting their arrival resting on his hands, so flying a plane is not only about technical skillfulness but also about thinking efficiency. Flawless vision is a must for commercial pilots since much of the flying has to do with their ability to analyze a situation owing to their vision. So aspirants with slightly impaired vision have to follow a strict regime if they want to get past the instrument rating test on their aviation course. Before becoming a commercial pilot, one has to be announced fit for duty on account of one’s sound mental and physical health. Because by no means flying a plane is for the weak hearts not to mention the feeble minded. 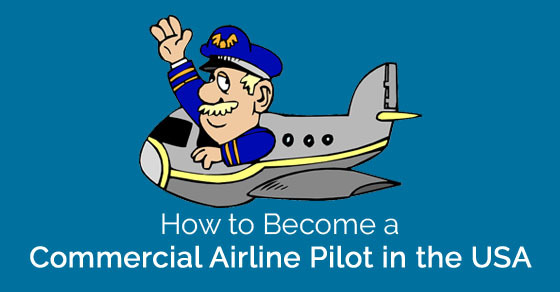 So to become a commercial pilot, one has to set an early goal so that one can take preparations from an early age in order to rise up to the commercial pilot requirements needed to become a commercial airline pilot. Commercial airline pilots in the USA have to be willing to work at any hour of the day or night, because they work in shifts which have been allotted to them. If you think that you will not be able to adapt yourself to work in such a way, then maybe you ought to opt for another career. Generally becoming a commercial airline pilot depends on your dedication to your training pertaining to the course. Advancing your way up from zero to airline is a matter of how attentively you can deal with your study program owing to the various tests that are taken to ascertain safe grooming among fresh pilots. Although it is not necessary to have a college degree it is advised that aspirants take up the extra pains of enrolling themselves to a aviation academy so as to eliminate competition. Usually to land that dream pilot job, one has to be in the chase for a considerable amount of time since in light of the few unfortunate events in history the FAA has stipulated the necessity of acquiring a private pilot certificate before taking charge as a commercial airline pilot. So the period of time entailing procurement of private and professional certificates is more or less about 4- 6 years depending on how frequently you take tests and declared fit to be promoted to an advanced level. More over flight programs at various flight schools are managed differently, and since completing it all is going to take more time than you can possibly assume, it is best that you research a little before you hurriedly register yourself to an institution having a very prolonged and tedious schedule. More so, flying a plane primarily has to do with practical application regardless of how important theoretical aeronautical knowledge is. Therefore, special care is to be taken while preparing to be a private pilot. As soon you have acquired your private pilot certificate make haste on getting an instrument certificate. One has to appear and qualify through a number of tests and stages in order to become a licensed commercial airline pilot. These tests do not fall immediately one after another because it takes about months of intense and rigorous training as prescribed by the FAA to ensure safely of the passengers. At this stage each candidate has to complete a training required to mark his skills in relation to landing the flight at an airport. The following mentioned are few pilot requirements that one should possess to enter in a pilot career. Like any other professional arena, becoming a commercial airline pilot requires a thorough set of skills approved by way of certificates and ratings. At every step right from the beginning students has to get themselves tested on certain abilities for flying a plane like instrument rating that qualifies a pilot to efficiently handle the flight and landing in domestic conditions so as to certify his skills as a tried and tested pilot. Other requirements that are integral to this flight program are: a commercial pilot certificate, a medical certificate, multi-engine certificate and finally an airline transport pilot certificate. After acquiring a private pilot certificate and dedicating enough time, lock the skills as a solo domestic pilot one can fly his own plane as long as he is not getting paid for it. Once the candidate becomes adept in flying private planes he is required immediately to move on to the next level that is acquiring a commercial pilot certificate. Now once past the private pilot rating the trainee is assumed capable of handling the basic maneuver in air with regard to flying a plane, so this stage is devoted to training them in commercial planes. This mainly includes a yearlong grueling training that includes most of the pilots flight time requirement in his training period as set by the FAA. Every attempt made so far may unceremoniously flush down the gutter if the trainee is declared unfit for the task. This can lead to the immediate rejection of the candidate as no flight organization wants to leave the responsibility of hundreds and thousands of passengers on an ill employee. Moreover this is not a one-off examination since nothing can be said of health, hence tests to check physical and mental health of the employee is always in order at an interval of months. This has to be approved by an FAA appointed medical examiner who would diagnose the vital conditions of a pilot before and after flight and would also accompany him on his flight. This test may take place time and again since chances of any new development in the person’s mental and physical health can never be completely out of the question. This phase of training is quite towards the end of your course and deals with the pilot’s knowledge in matters of flying a plane with multiple engines as most planes nowadays have. In precedence of the growing rate of travel, the commercial airlines have to cater to this progressive need of the customers and in doing so having taken to recent developments in technology the airlines have had to increase the number of passengers to be travelling on board and has gradually led to the use of more than two engines to support the weight without losing altitude. This test is again going to be rated by an FAA assigned examiner who is going to accompany you on your flight and scores will be based on how adequately you can manage to work all the engines systematically. This the final step on your journey to becoming a commercial airline pilot, this will include going through all the above markers in a row pinpointing your last few flights under supervision before becoming a licensed pilot in addition to the hours of flight you need on your data card to be allowed to fly. This test is mainly based on your aeronautical knowledge and applying them confidently in normal as well as desperate measures. To successfully become an ATP (Airline Transport Pilot) you will have to minutely follow the guidelines set by the certified instruction who is going to rate you all your assignments. In addition to the 1500 hours of flight that needs to be covered during the course of one ought training in the USA ,the pilot has to fly an extra of 250 hours to be legally assigned as fit to fly a commercial plane. Narrowing down on one career path is always a tough thifng to do. Ensure that you take your time and make the right decision for yourself as choosing the right career line is very important.